Identified in 2008 as one of the state’s Places in Peril by the Georgia Trust for Historic Preservation, the Adam Strain Building is one of only two survivors of the 1863 burning of Darien by Union troops, and is the oldest building in the city. 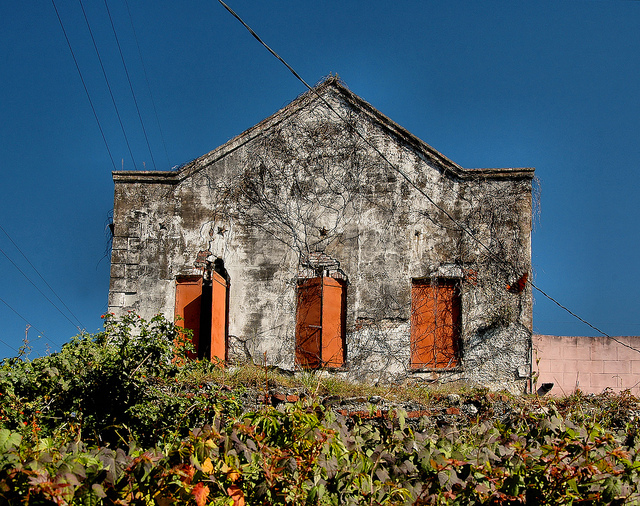 Concerned citizens are working hard to save the structure; however, its future is still very uncertain. McIntosh County historian Buddy Sullivan noted in his excellent book, Early Days on the Georgia Tidewater: The Story of McIntosh County & Sapelo: “Although the waterfront warehouses were destroyed, the thick outer walls of the two-story building on the upper bluff later known as the Strain building, survived. This structure had been built ca. 1815 and still stands as Darien’s oldest building.” In mentioning the “thick, outer walls,” he refers to the 1870 refurbishment, necessitated by damage during the Civil War. 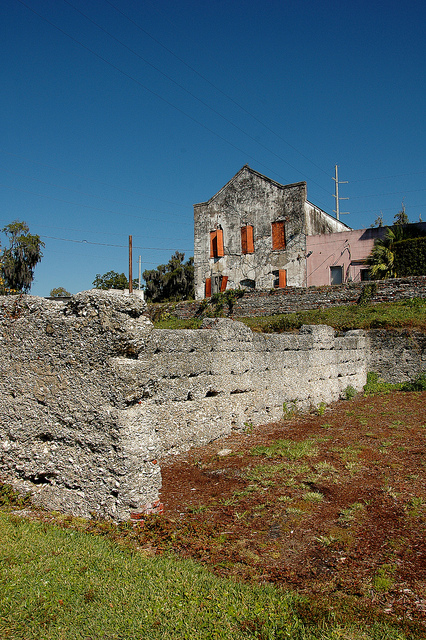 This view shows the circa 1810 ruins of tabby riverfront warehouses which supported the growing cotton and timber trades and made Darien the second busiest port in Georgia in its heyday. I too have shot this building. It’s a shame the electirc wires get in the way. I’d love to share a photo or two with you. When is the festival, Mike? I want to here Buddy Sullivan’s presentations. We’re also heading to Lyons on Friday. I’ve got to see the post office. Can you recommend some good, down home places to grab some grub between Lyons and the Darien/Brunswick area. We usually eat at Skipper’s or B&J when in Darien, but we haven’t been in the Lyons area yet. With all your ramblings, you should consider another spin off – Vanishing South Georgia Roadfood. 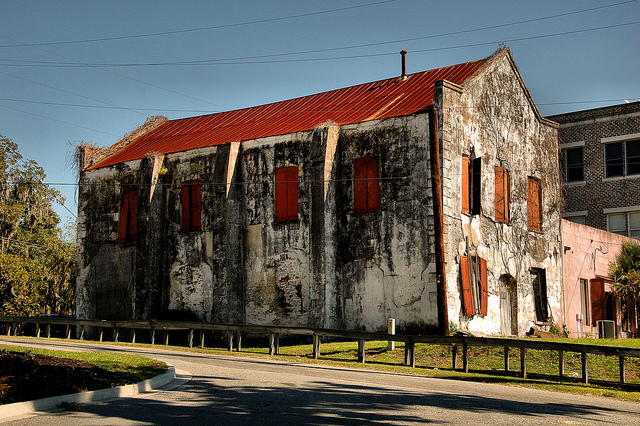 Considering its history, isn’t it funny that this building now looks so … burned? It really catches the eye and I hope someone can save it. My list of “hope someone can save it” buildings is so long though. Mine is way too long, too, Sherri. A wonderful building which is just one example of why Darien and the surrounding area is so important and worthy of preserving. Brian, thanks for your good work.